Measurements:	6.03 x 6.03 x 4 mm. Medium blue colour with a tint of grey. 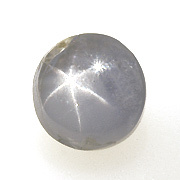 The stone has good star phenomenon but also is colour zoned.